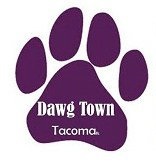 The best dog trainer in the South Sound! I would highly suggest all dog owners contact Garrett for any help regarding their pets. He has worked with both of my dogs and did a remarkable job. 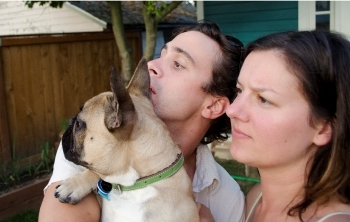 A month ago he also provided training for a dog from the French Bulldog Rescue Network. He did such a great job helping not only the dog gain confidence, but me as well. The dog had resource guarding issues, as well as bad anxiety. Garrett conquered those issues and gave us tips to last a lifetime. I am a more confident dog owner because of him and I can't thank him enough. HIGHLY RECOMMEND FOR ALL DOGS, ANY ISSUE. My wife and I went to the pet store to buy our cat a new bed. There were several rescue dogs there. One dog stood out, and with a quick decision he was coming home with us. He is a Belgian Malinois. With some research we found out his is a breed being used for police work. The rescue group told us he was from Miami, Florida therefore his name became Kilo. Research also told us to get proper training or this dog would rule us! Garrett Stevens of Alpha and Omega Dog Training came highly recommended. During our first session it was obvious that Garrett was a professional with real enthusiasm for what he was doing. Within minutes he had control of our dog! It was very impressive. Garrett seems to understand the mind of a dog and just as important as dog training, was owner training. Garrett opened up our minds as to how dogs learn and he taught us, the owners how to train. After several sessions Kilo has become a very obedient dog that Katie and I are very proud of. With Garrett’s training of us, the owners, we have been able to teach Kilo many things. 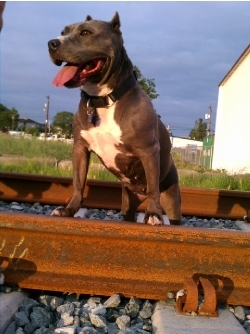 We have received many compliments on how awesome Kilo now behaves. I would truly recommend Garrett Stevens to anyone with a new dog, or an old dog that needs to learn a new trick. Thank you from a VERY SATISFIED CLIENT. Garrett Stevens, owner of Alpha and Omega Dog Training, is the most knowledgable and effective dog trainer I've encountered during my years in the pet industry. He actually studies the way a canine brain works. Because of this, the dogs and the humans he works with see positive results 100% of the time. As the owner of a busy doggie daycare I use Garrett's techniques every day of the week. My clients are important to me and Garrett Stevens is the only dog trainer I trust to give them the results they are looking for. We sought Garrett's help after we adopted a pit bull from a local pit bull rescue. Although she was a loving caring sweet dog at home, we had several problems with her on the leash, pulling, over-excitement and aggression with other dogs. We tried other trainers with different training methods with no results. She actually was getting worse with some of the methods we were told to use. I have been around dogs all my life and am somewhat of a decent dog trainer in my own right and by this time I was really frustrated and was having a hard time finding people willing to work with my dog. I knew I needed help so I called Garrett out of desperation. After one hour long session with Garrett the changes in our dog "Piggy" were amazing. He has the amazing ability in his observation of dogs to correct bad behaviors and show you how to become a true leader of your pack. It is a wonderful thing when you start to see the dog you always envisioned emerge right before your eyes. I would highly recommend Garrett and his style of dog training for All types of dogs and Humans. Garrett is the only trainer we recommend! He is great with dogs and people. His methods differ from other trainers because he gets great results no matter how difficult the dog. 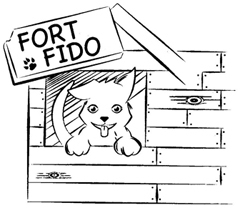 Everyone at Fort Fido HIGHLY RECOMMENDS him! Before we started training with Garrett it was very difficult to walk Chance without him being the leader. Now (after training) we can take walks and he listens to our commands. Chance will heel and sit when asked to. Most of all, Garrett’s training helped us with the problem of how Chance would deal with company and friends that would visit us. We used to place him in his cage all the time. Now we use a lead to control him and are able to let go of the lead and actually have Chance accept any company that we have over visiting! Garrett’s training has taught us to be in control of our dog Chance, and not have Chance control us. Thank You for your advice and expertise. 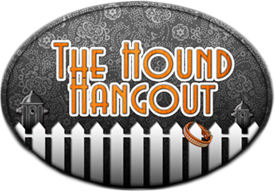 We first heard of Garrett Stevens and Alpha and Omega Dog Training from Hound Hangout, they were offering Basic Training classes through him. 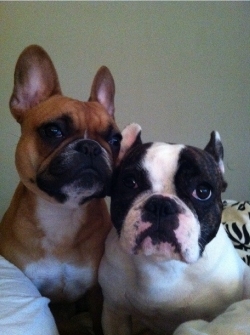 We decided to sign up for it and went into it with no expectations other than to learn some basics for our French Bulldog puppy and have some bonding time with our other dog Porter. We were pleasantly surprised to see that it wasn’t just your run-of-the-mill ‘sit’, ‘stay’, ‘come’ class. Garrett took the time to discuss dog psychology and helped the owners be more in tune with truly understanding what our pets were communicating to us with their behaviors and body language. By the end of the class we were working on some advanced training skills! Since we had such a great experience with his training classes we decided to have him do some privates with our pack, who weren’t quite perfect. Garrett has been great with all 3 of our dogs and has really helped us understand dog psychology even further. We like that he doesn’t use one approach for all of our dogs; he tailors corrections (always calming) and direction to our dog’s actual personalities and needs. He does a lot of hands on training with us as well; we have come to learn that it really isn’t our dogs that need the training but it's US! We have been pleased with all of Garrett Stevens work and have even had him come back to help us with tune ups. We wouldn’t hesitate to recommend him for any training needs; in fact we are always referring people to him! Most recently I had a dog walker spend an hour with Koji. She was never able to make peaceful contact with (including not getting him to take a treat from her). Koji was growling and threatening for the entire hour. After an in home visit with Garrett, I was able to learn better skills for managing his agitation including not giving verbal commands. Garrett also talked with the dog walker sharing his suggestions. As a result the dog walker returned using the suggested strategy. Koji was out the door with her in about 5 minutes. When they returned ½ an hour later they were both relaxed. The walk was calm and uneventful! While I talked with the dog walker Koji laid down between completely calm. I adopted Mikey on September 5, 2009. The couple that gave him to me said that he was from a puppy mill. He was intelligent, affectionate, but aggressive. On walks, he became over excited and uncontrollable when he saw another dog. He pulled on the leash and charged other dogs, jumped and barked. When visitors came to my home, he charged them, barked uncontrollably, and tried to bite them to make them go away. He actually bit Garrett in the leg! He was overprotective of the house and yard. He stood watch at the window waiting for something to approach so could bark and make a fuss. He used to jump up and hit the bird cage to make noise and watch the birds flutter. After working with Garrett, I feel Mikey has improved and will improve even more with time. On walks, I now have more control. I am able to redirect him to focus on me by backing him up, and changing direction in which we walk. I use my crutch to redirect him. I am more aware of potential problems and take action to avoid them. I can remain calm and have more control of him. He still needs work in this area but I know what to do. In the past I was told to feed him to keep his attention but this was only reinforcing his troublesome behavior. When visitors now come to my home, Mikey is told to go to his place, sit, and down. He is learning not to charge the door. He has started behaving successfully with visitors. I have completed exercises with him by rigging the doorbell and having friends enter. The exercises have been working. Garrett’s suggestion that I keep him on a leash while we practice was a great help. I can catch him more quickly and keep his excitement from escalating. He is less aggressive to the birds and is learning not to get over excited and bang on their cage. Garrett has emphasized the need to remain calm, use hand signals and speak softly and this is working. I now see that Mikey is affected by my mental state. With patience, practice and time Mikey’s behavior will improve even more. I rescued Izzy when she was four-months-old; she’s now five-years-old. She has always been a great and loving dog but is stubborn, domineering and has separation anxiety. After my ex and I split a couple of years ago, Izzy stayed with him for nine months. During that time, she went through a lot of change and, when I got her back, her anxiety was worse than it had ever been. I couldn’t leave Izzy alone because she would destroy the house or car but she couldn’t be with me all day, every day either. I tried everything I could think of to help her – doggie daycare, a ThunderShirt, doggie Prozac, DAP (Dog Approved Pheromone), and Rescue Remedy – but her anxiety was just too high. She was constantly on-guard and aggressive with and domineering of other dogs. If we even saw a dog while walking, Izzy would pull and lunge, jump on and nearly knock me over. We got kicked out of doggie-daycare and dog parks weren’t a safe or responsible option even for short periods of time. Then, even though she didn’t cause any harm, when Izzy bit a passer-by, as we were sitting on a bench, I became afraid to even walk her. Feeling scared and defeated, I finally called Alpha and Omega and asked for help. When I spoke with Garrett, he seemed so un-intimidated, immediately putting me at ease. He was so knowledgeable, helpful and ready to take Izzy on. Even on the phone, he shared strategies that we would work on together and assured me that these issues could be resolved. We met that week and Izzy instantly responded to him. It was quickly obvious that Garrett is an absolute natural! Garrett’s approach, advice, techniques and homework were all easy to understand and put into practice. Izzy and I worked with Garrett and his dogs during a series of one-on-one sessions and I’m so happy to say that she is doing MUCH better. Her anxiety is much, much lower; she’s socializing with other dogs and people; we’re able to go to off-leash dog parks, and we frequently receive compliments on what a good dog she is. In fact, just the other day, I ran into a woman who told me she wished her dog was as well-behaved as Izzy, saying that, like Izzy once did, her dog runs her life. I sympathized with her and recognized the embarrassment and fear she bore and suggested she call Garrett. She’s not the first person I’ve referred to him though. I sing his praises to anyone and everyone who will listen because Garrett is amazing. If it weren’t for him, I can honestly say that I don’t know where Izzy and I would be right now; I’m just so thankful for his help! Garrett did a fantastic job with my dog Dozer. Dozer was extremely aggressive with small dogs (He killed one and severely mauled another!) and with our new bulldog puppy (Lamb chop). Dozer was also growling at my girlfriend. Garrett had him under control in no time! Results came in weeks – not months. Garrett Stevens is extremely knowledgeable, professional and passionate about what he does, and it shows. I highly recommend his services to anyone with any size dog. Garrett also used one of his dogs to help train Dozer with his dog aggression issue. I highly recommend this. Thank you very much Garrett! My wife and I wanted to thank you for setting us on the right course to train our Pitbull “Kai”. He is an awesome dog, but was a bit of a problem when socializing with other dogs (aggression), and showed dominance in and out of our home. He began to improve immediately under Garrett’s guidance. Kai is now able to be controlled on his walks and his behavior with other dogs has changed a lot. Because of the great tools Garrett provided us with we understand the best ways to communicate to our dog and correct his behavior. Garrett has both great dog training and communication skills. He relays the information in a very positive, patient and compassionate manner which was very helpful. He is fantastic, and we highly recommend him. Rainier would go wild running back and forth in front of the windows facing our back yard. He would also be barking anytime he would see cats in the backyard or hear the phone ring or the front doorbell. Garrett worked with us in asserting ourselves as the “Pack Leaders” so we could reclaim the space in front of the windows and the front door. He did a great job explaining dog behavior and why it was important to get Rainier into a calm state. He also helped with keeping Rainier from running out the front door whenever it was opened. He also worked with us in getting better control on our walks. Charlie is a fun people-loving bulldog that we have had for about two years. Charlie had never received any type of training in the past. We are his third owner and we found out soon after becoming his owner why Charlie has perhaps had a difficult time fitting into other homes. Charlie was incredibly aggressive with other animals despite his behavior around people. He unpredictably attacks other dogs and mauls them terribly to the point where we have actually considered putting him to sleep due to liability and trauma he has put on our neighbors and any dog that passes our home and Charlie has gotten out and been unfortunate to reach. We met Garrett, of Alpha Omega Dog Training. We arranged our very first meeting with Garrett and within 15 minutes he was able to come into our home and demonstrate to us that he was able to show our pet Charlie who is dominant this initial meeting with Garrett and also allow us to have hope that we would not have to put him down and there would be some way we could train him. In the weeks that followed in training with Garrett and the few training sessions we had, we were able to see immediate results with Charlie’s behavior. We were able to change the dominance and aggressive pattern by working with Charlie and using the psychological-type training methods that Garrett presented to us. Garrett’s training is unique and he really understands the pet’s psyche. He is not the typical type of trainer that involves reward, praise, food, but explains how an animal thinks and how an animal need to be rid of behaviors such as aggressive behavior. We are very pleased with Garrett’s training and would Highly Recommend him to anyone who has a pet that is viewed as un-trainable or overly aggressive around other animals. We continue to work with Charlie, but he has shown huge changes in just a few visits in our training sessions with Garrett. Thank you Garrett for your work thus far. We look forward to working with you in the future with our other pets. Garrett is Amazing. He got our one and a half year old border collie, Romeo, heeling in just 10 minutes! 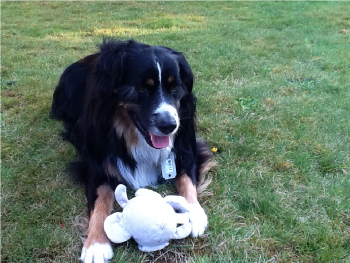 After a few one-on-one private training sessions our dog is actually controllable! We've done at least 5 training courses with other trainers with no results! Once we were even told our dog is a "danger to society" since he didn't behave the way he was expected to in front of the trainer and we got kicked out of there. Garrett would never do that. 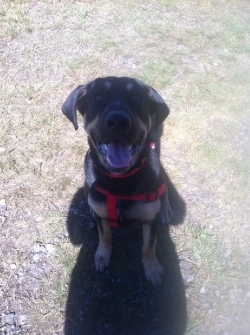 He knows the dogs and their behaviors and that different breeds need personalized training. I like his saying NO DOG LEFT BEHIND. Garrett came to the rescue! 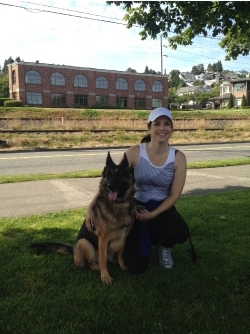 I needed a trainer to help me quickly as I was 7 months pregnant and had little time to get my high energy puppy trained before the arrival of my baby! Garrett's an amazing dog whisperer! Within just 3 private training sessions I was trained- ha! Then I used my new training to understand my puppies behavior and get him to stop nipping my heels and instead start coming, sitting and staying when I asked him to. He even helped instruct my dog walker on the proper heeling techniques to get better results on their walks! Garrett was always on time, a professional, and very knowledgeable. I would Highly Recommend him for anyone with a wayward pup or any other dog problems, or if you just want to reach the next level of training! Garrett is a phenominal dog trainer and dog whisperer. His puppy class and group obedience classes were fun and packed with interesting information. My puppy loved it and I got a lot out of it. He has a special way of teaching the dogs and the people in attendance. Garrett is the best dog trainer out there! The collars he hand-makes are fantastic and work really well on little Albus. We all saw a big difference after just 1 minute with the collar on! I plan on contacting him in the future if my dog ever needs a "tune-up" on proper dog behavior! 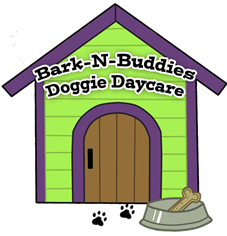 Dinky Dogs Daycare is thrilled to have Garrett Stevens as a dog training/behavioral resource. His work goes well beyond the basics- sit, stay, etc. He explains dog behavior in a way the average pet owner can understand. Garrett's calm demeanor makes him very easy to work with and his results are Guaranteed! With his help your dog will find balance and a rewarding, positive relationship with you- the pack leader! That's a Win-Win! I highly, highly recommend Garrett Stevens and Alpha and Omega Dog Training. My dogs used to be aggressive when on leash and were excessive barkers. 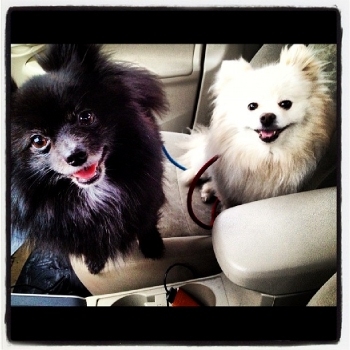 I was too embarrassed to walk them when people were outside or if other dogs were around. I would even go as far as crossing the street or turning around to avoid other people and dogs. They would bark anytime they heard things outside (the house) or when they saw people. They barked when the door was knocked on and continued even when the guest was in the house. They would even bark at people they already knew! Since Garrett's training things have been much better! In just one session I saw results using his techniques! Garrett provided me the tools and training/whispering I needed to help my dogs. My dogs are less aggressive now and I can actually take them on normal walks and pass by dogs without the chaos of my dogs barking and being aggressive. The barking has also calmed down in the house. I love the fact that there is much less yelling and barking! I honestly didn't think my dogs could be trained. Thanks to Garrett and all his help I can continue the training and continue to see results with my dogs. I would recommend Garrett for all your training needs! Garrett is a great listener and a wonderful interpreter (of canine behavior/body language) to teach us what our pets need. I recommend him to my clients often! The thing I appreciate most about Garrett Stevens is his calm but commanding approach to dog/human training. I would never have believed that with just two sessions in our home, our dog's behavior could be changed so dramatically. I highly recommend Garrett, not only as a dog trainer, but as a patient and understanding human trainer. He showed us that our dog just wants to understand the rules and he helped us learn how to convey them. Charlie is doing great and it's amazing how well he's doing on his walks! It's a miracle. 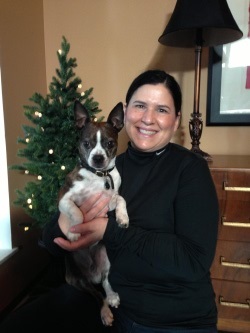 The staff at Urban Hound highly recommends Garrett Stevens and Alpha and Omega Dog Training. He has worked with several of the dogs that attend our dog daycare and the result is truly amazing! Garrett has a unique way to communicate with the dogs he works with to really get them to work the way they should. He also is very good at getting the dog owners to be aware of their continuing responsibilities to work with their companion in order to receive the full benefit of their training with Garrett and become the wonderful pet they really want. Garrett was so patient but still firm with Jackie, which was something this independent teenage dog needed. We would highly recommend him to any dog owner, whether for basic in home or group training or for problem dogs. Garrett Stevens is truly a "Dog Whisperer." We are now able to enjoy relaxing and fun walks with our dog- no more lunging and barking at people and other dogs! My husband and I took our 5 month old French Bulldog to Garrett's Group Classes. We mostly wanted to train Gaston to be more obedient in the presence of other dogs. Garrett's knowledge of dog training really helped us be better dog owners and Gaston became the best student (in my eyes). We still have some nipping issues at home and we will be talking to Garrett again for some Private lessons. I highly recommend Alpha and Omega Dog Training for any group/ any breed/ any issues. Garrett knows what he is doing! Greetings from the Jenkins family, Garrett! Lucy and I wanted to send you a big thank you for your continual confidence in both of us throughout our training over the last 4 months. Your knowledge base, philosophy, and training techniques cultivated results which far surpassed my expectations in both the group and private training sessions. The bond between us is now strong and respectful, and continues to grow - a product of your profound understanding of the K-9 and their owners. "Coming together is a beginning - Keeping together is progress - Working together is success." Buddy and I wanted to write to say, Thank you with our walking. We have had two excellent walks in a row now where Buddy heels and waits at the door until invited out. (Buddy used to rush the door, stairs and had dog aggression on leash) He is also doing excellent with stairs. He is a changed dog! We are so pleased. We will continue to work on Buddy's dog socialization skills. 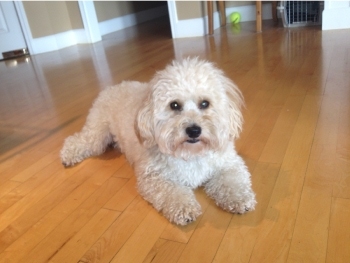 Our dog Moose suffered from obsessive barking at guests and door noises, would freak out when near dogs and some people/ bicycles when leashed. She did not heel or come when called. She had separation anxiety - drooling, barking, chewing and other destructive behaviors. She did not respect us. Tank would bark aggressively and scream when near other dogs and people. He was very fearful. He would run from everything. Now...Both dogs heel perfectly and ignore other dogs (even if the other dog is misbehaving!) Moose finally looks at us when on walks. They are much improved when guests knock at the door. They have great confidence with repetition and practice. Moose is much, much faster at calming down when it's time to be let out. Tank lays down when I don't let them out right away. Both dogs are more calm in general. We can't wait for field trips to the market with them! Thank you for your commitment, patience, and wisdom. It has been a pleasure and an honor to work with you. We've really appreciated the opportunity you have given us. Thank you from the entire Hiller clan. Who knows we may see you in group class. Garrett Stevens helped us tremendously with our dog, Bear. Bear was very, very territorial of our home and never welcomed anyone inside. He was also very difficult to walk, constantly pulling us and would go crazy if anyone came near us. After the first in home session with Garrett, Bear was already showing signs of improvement. With each lesson he would get better and better. With the tools Garrett taught me I can now continue to work with our dog and have people over without it being an issue. And Bear is much easier to walk. He seems like a much happier dog because of this. If that cute, funny, lovable puppy of yours has become an overactive teenager in charge of your life, I know the solution to your problem...Call Garrett Stevens immediately for help. My year old Sheltie was barking at the neighbors, jumping on people, even trying to chase cars. This behavior had to stop. Luckily in my search for help I found Garrett. He worked successfully with my four legged friend, but primarily he taught me the necessary skills to be the alpha (a calm but firm leader like a great parent should be). I now have a well behaved, lovable friend. 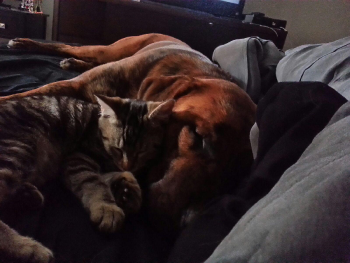 After adopting our 4 month old, 4 pound kitten we were worried how our 75 pound Mastiff mix, Rocky, would act towards her. After introducing Rocky to her ourselves, we realized that it wasn't going to be as easy as we thought. After a week we decided to look into a dog trainer. Garrett helped us control not only how our dog reacted towards the kitten but also helped train us to understand his needs and to read him. We are now able to let the kitten and Rocky roam the house together and they enjoy each other much more now. I would highly recommend Garrett to help you make your dog into the "Dream Dog." Amazing dog trainer! Garrett’s approach to training dogs is fantastic. Well worth the price to have a well behaved dog. His training works for all dogs with any types of issues from aggressive dogs or those that are too timid and everything in between. Thank you, Garrett, for helping me to speak "dog." You have allowed me to grow a true rescue/stray dog into a well behaved dog. Jack deserves to be the best dog possible and I couldn't have helped him get over his fears and aggression without your dog whispering help. 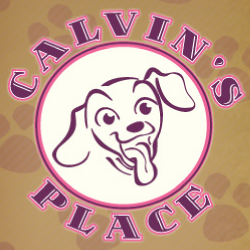 The staff here at Calvin’s Place Doggie Daycare highly recommends Alpha Omega Dog Training! We interviewed over a dozen trainers before picking Garrett Stevens to join our team and we couldn’t be happier about our choice!!!! We love hearing all the positive feedback from our clients and others in the community on how well their dogs are doing after working with Garrett. We look forward to a continued partnership with Alpha Omega Dog Training and Garrett Stevens! 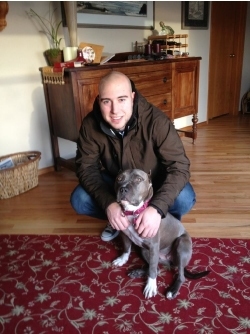 Garrett was awesome in identifying the problem areas to work on with my pitbull, Leia. Within the same day I saw a huge difference in Leia's behavior! I would highly recommend Garrett to anybody who is interested in fixing certain behaviors in their dogs. We went searching for a dog trainer when our large, German Shepherd rescue was chasing after every dog she saw, barking and generally scaring everyone. We were a bit afraid our rescue was not able to be trained. We feel fortunate to have found Garrett and Alpha Omega Dog Training. Garrett was able to make time very quickly to come to our house and help us work with our Shepherd, Jackie and our three year old Daisy, who was picking up bad habits from Jackie. We saw huge results after just one session with Garrett. He has a very practical and educated approach to working with dogs and understanding their energy levels. We had never considered energy levels prior to Garrett, but now we watch for elevated energy levels all the time with our dogs. It allows us to take time to calm them down so they can be successful in whatever situation we put them. Garrett was able to show us how to get results from both dogs immediately in our sessions, which allowed us to breathe a sigh of relief that our dogs were, in fact, trainable. After showing us how the dogs could respond he worked with us to get the same responses. We used Garrett for a few sessions and in fact had our neighbors bring out some of their dogs so all the neighborhood dogs could learn to behave together. We even took him to the dog park with us to help us work with the dogs there, as they often ganged up on other dogs. Garrett is truly a Dog Whisperer. He took my big burly dogs and helped us to help them show their best side to the outside world. We are hugely grateful for his wisdom and guidance with our dogs and put to use his training techniques daily. Only wish we had contacted him sooner, it would have saved us a lot of worry. Garrett Stevens is the best dog behaviorist! 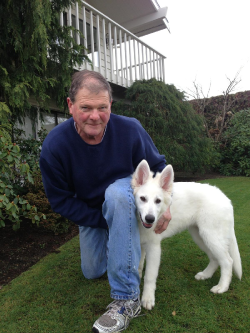 We are so thankful for all his help with "Sadie," our German Shepherd puppy. Garrett has taught Sadie and us so much in such a short amount of time. If you've got a puppy I would highly, highly recommend you get someone who knows the insides and outs of the canine brain. Garrett gave us the tools to help our growing puppy develop into a beautiful and calm young dog. 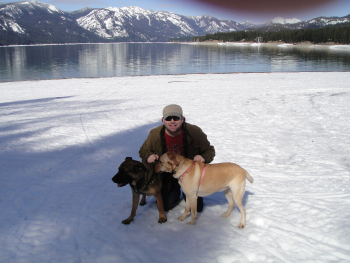 We Highly recommend Garrett and Alpha Omega Dog Training. 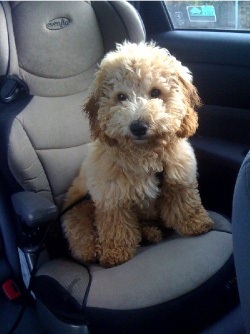 And we look forward to a few follow up sessions in the future when our dog is older. Garrett is the best pet trainer I have ever met. I've been very impressed with his knowledge. And that is saying a lot coming from me being in the pet industry for over a decade. He is very professional and very approachable. All of my clients that have used his services have loved him! He has helped them with their pet problems. Which means so much to me that I can refer and rely on Garrett for all of my clients. My clients are like family to me. Thanks, Garrett, for taking good care of everyone. Garrett Stevens came to the attention of Sunny Sky's Animal Rescue through one of the employees who introduced him to many of the volunteers at the shelter in Puyallup, WA. Garrett came to the shelter to do a presentation using several of the dogs who had issues that the staff and volunteers were not comfortable working with. 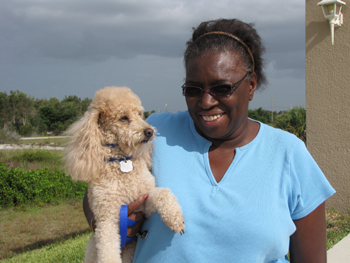 Rather than training the dogs, Garrett trained the volunteers in how to help the dogs with their issues. That was an extremely valuable lesson learned for us. A few of the volunteers also went to a "Fearful" dog seminar that Garrett gave and we learned a lot in that session on how to help dogs with that particular issue. He taught us that we can do more harm to dogs by not treating them as animals and by trying to turn them into our "babies." I highly recommend Garrett for helping pet owners with any issues or with any dog. Genuine, knowledgable, experienced, and proven results! I brought home an 8 week old puppy and thought to myself, What did I just do? She was my first pup and I needed some desperate guidance. Garrett was a perfect choice! After a few private sessions with him I began to understand dog behaviors and body language. 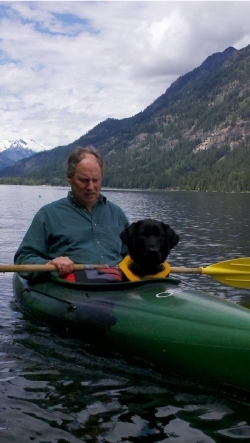 He makes training relevant and fun using your dog's natural instincts. He teaches you how to communicate to dogs and engage them. In addition to his knowledge he commands respect (from me and my dog.) He exudes this energy that my dog really responds to. Seriously, it's like a super dog-engaging force field! I've done two group obedience classes with other trainers. One class was great and mainly for young pup socialization. The other was out of location and inconvenient and a huge regret. She sucked, Majorly sucked: artificial, "textbook" teaching style, and low skilled. Garrett is the opposite. I could sing his praises for hours on end. He teaches you how to use your dog's strengths, training both traditionally and with dog whispering. (His traditional methods are far superior to other drones though!!) Both methods (training and whispering) are useful for different circumstances. He teaches things you use in real life: my dog is so good at staying out of the kitchen, if her ball rolls into the kitchen, she just sits there staring at it with her nose at the border. I love my dog and wouldn't put her in anyone else's hands. I found Garrett through the Pet Brigade on Ft. Lewis. I have a Thai Ridgeback that was a rescue from Thailand. He was in very poor condition when I got him and because of that, I fostered many of his bad behaviors because I felt bad for him. I was at my wits end because "Mako" had a lot of aggression (which I learned was based in fear). Garrett came over and immediately diagnosed Mako's fear. Garrett has made REMARKABLE progress with Mako in just 3 short visits! I am beyond thankful that I found Garrett and Alpha and Omega Dog Training. Garrett is so knowledgable when it comes to understanding and correcting behaviors. I would hire Alpha and Omega and Garrett again in a HEARTBEAT and will sing his praises to anyone in the military community AND in my personal life for anyone that has any dog issues they need help with. Yes, he looked cute, but our new little lab puppy came with a BIG food aggression problem...full-on snarling and growling. We are both animal people (veterinary technician and zookeeper) and experienced dog owners, but nothing we tried was improving "Mica's" behavior. Garrett came highly recommended by one of the vets I work with, and he set up a program for Mica that was simple, gentle, and practical. It immediately improved his behavior...we were amazed and grateful. Garrett demonstrated everything so that we felt comfortable following through on a day-to-day basis. He answered all our questions with patience and courtesy, and it was a joy to watch him interact with Mica and our other dogs. Garrett communicates with the dogs in a way that they not only understand but want to comply with. We have profound respect for his knowledge and experience. Every client we have referred to him from our veterinary hospital (Chambers Creek Veterinary Hospital) has been impressed and thoroughly delighted with the results of his training...we can now count ourselves in that number! Garrett Stevens of Alpha and Omega Dog Training is AMAZING. "Harry" is a very loving dog but had some behavioral challenges - Barking like a mad dog at people at the door and passersby, jumping all over people who walk through our door, pulling me on the leash while walking, lunging at passersby, etc. I had given up the possibility of getting them (-behavioral issues) under control, as I had no luck with training methods at other establishments. I thought I'd give it with Garrett and I'm so glad I did. Garrett's methods quickly identified what training was needed for Harry and I to best accomplish my goals. He established simple techniques easily incorporated into our daily lives. I was blown away with what we accomplished in one hour and I'm pleased with the progress we've made since Garrett came into our lives. This summer my niece and I enrolled in training classes from Garrett Stevens. We were very impressed with his firm but kind nature with each dog and their different personalities. Their response to him was so positive. He took individual time with each handler when needed and managed to keep the large class on target. Garrett's methods proved to be very effective. Each week we saw visible improvement in each dog. We learned so much from him in those six classes, it truly was a class for both the handlers and their dogs. Each command we learned was simple and with a firm but quiet voice our dogs were responding to us in no time. We are extremely pleased with the amount of knowledge we took away from these classes along with the improved behavior of our dogs. 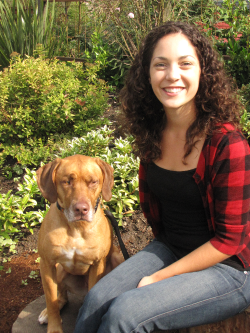 We both would highly recommend classes, both private and group, from Garrett Stevens, Alpha and Omega Dog Training. He does a great job! I found Garrett after completing my search for the best dog trainer in the Tacoma area. After reading the testimonials and talking with Garrett on the phone I knew he was the trainer I was looking for to train my 4 month old Shiba Inu. It was amazing how he taught Matt and I the importance of being consistent in training. He also explained dog training and dog whispering. Our little "Ginger" responded very well to the training techniques Garrett taught us. We feel with the investment we made we got more than expected and we have a very well behaved Shiba Inu thanks to Garrett.